Google helps protect your Gmail account against suspicious messages and content in multiple ways. Gmail will notify users by adding notifications within an email when any security related issues are identified. 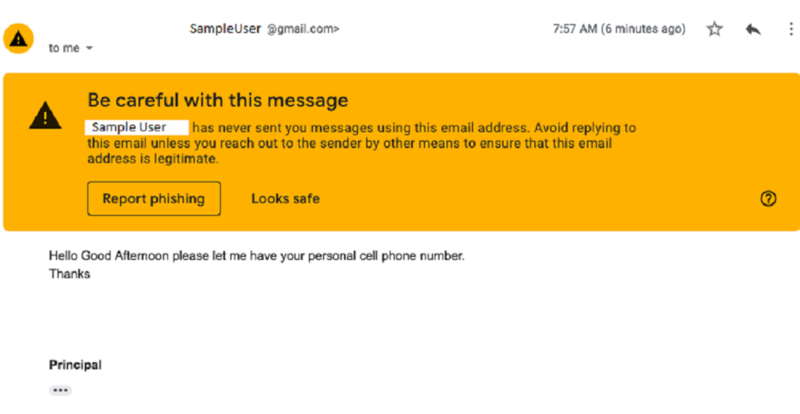 Warning banners will only appear for Google Gmail user interfaces (web, mobile). Third-party apps like the iOS mail application do not display a warning banner. Spoofing and authentication—Protection against spoofing a domain name, employee names, email impersonating your domain, and unauthenticated email from any domain (indicated by a question mark next to the sender’s name). Attachments—Protection against encrypted attachments and scripts from untrusted senders. Links and external images—Identify links behind short URLs, scan linked images for malicious content, and display a warning when users click links to untrusted domains. Yellow warning banners will appear when a message potentially has dangerous content. Red warning banners indicate that the message is dangerous. Even if you don’t see a warning banner from Google, always be on the lookout for suspicious activity. Check the message headers to make sure the “from” header isn’t showing an incorrect name. Gmail also automatically identifies spam and other suspicious emails and sends them to Spam. If you are expecting an email and don’t see it in your inbox, please check your Spam folder. Please see details here. Additional details on managing spam. Google documentation on how to unsubscribe from emails.